Silica Solution Feed Units | EGM, LLC. EGM has extensive experience with designing and constructing feed systems for colloidal silica applications. Whether used for highly-reactive, wet-end drainage additives or anti-slip surface treatment in linerboard production, EGM understands the challenges of constructing reliable systems and has proven designs to promote long and reliable service. 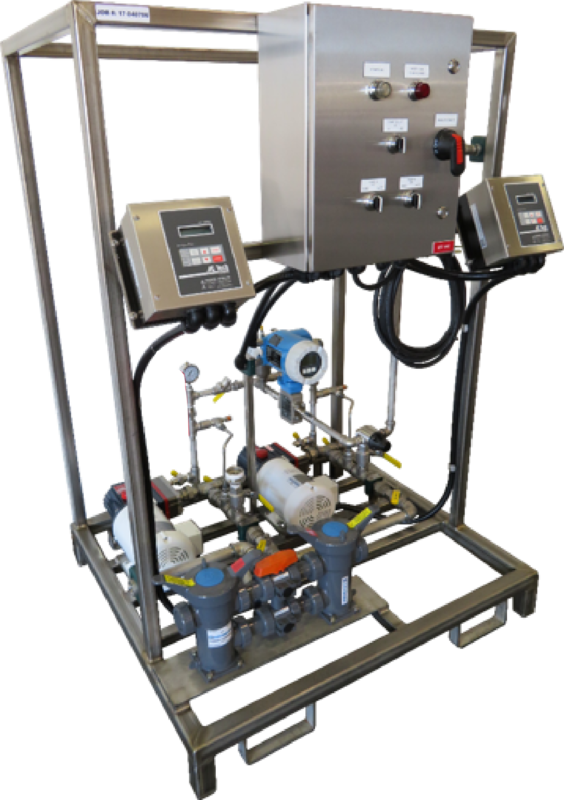 Utilizing appropriate pre-pump filtration, optimized line sizing to promote ideal fluid velocity, and properly configured pump materials of construction and post-pump accessories, EGM silica feed systems deliver accurate and repeatable flow. System configurations are available in single and multi-pump designs and on-board spares can be equipped for readily available backup pump service. Control panel designs can be built to accommodate any domestic or international voltage supply. Control panels can be simple power and instrument junction panels for incorporation into an existing supervisory control system or can be complete, stand-alone panels with process controllers or a PLC.